We have a few projects in the works, but as always things are taking longer than expected. But we did get a tiny project completed this weekend, it took us a whole 5 minutes to finish. 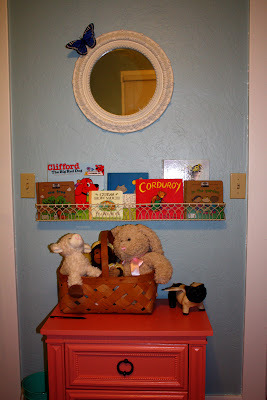 I love those quick and easy projects with immediate results! When I saw my aunt a few weeks ago for my grandma's birthday she gave me a metal wire rack. I wasn't sure what to do with it but I liked the design of it and figured I could find a place for it. 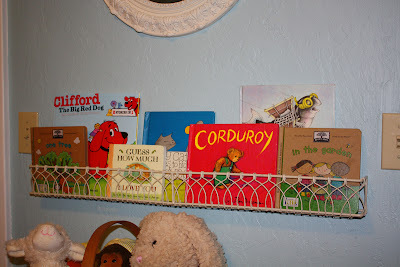 Yesterday morning before getting out of bed I stared at the rack leaning against the wall in our room and thought it would work perfect in the baby's room to hold some books. I had been picking up books at thrift stores and found a few more today, hopefully our baby is an avid reader! So here's a picture of the wall where I thought it would work. 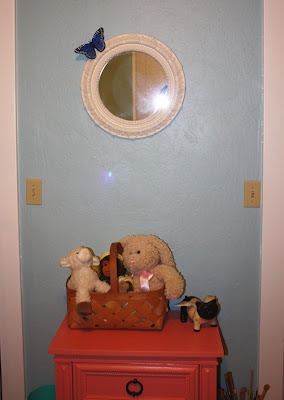 I also put some stuffed animals in a basket on the nightstand I painted here. I recruited Brian to help me with the hanging. We used a level to position the rack. Then Brian drilled pilot holes and attached the rack to the wall with extra long screws to hold the rack tightly in place. 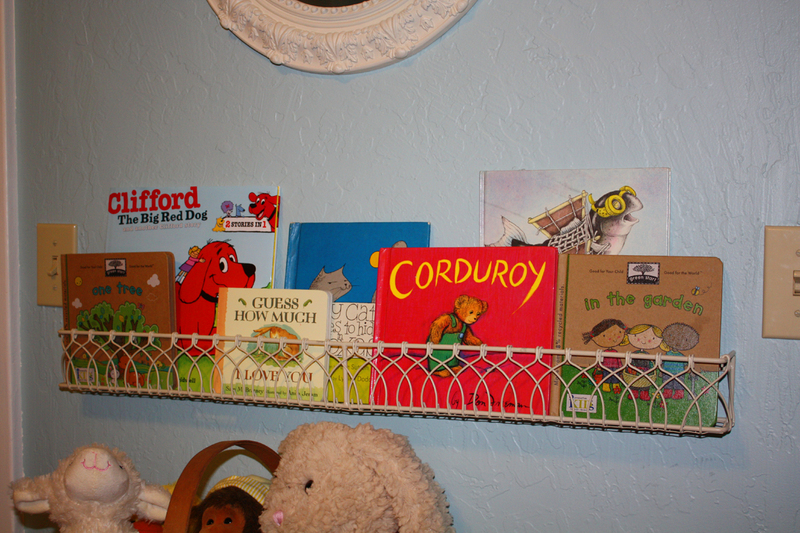 I figure we can rotate the books we have in the rack as we read them and as our baby's tastes changes. And I also have a whole collection of my own Nancy Drew books that I can now pass on to my daughter. Yep, it's a girl!